About: Villa Rosa offers a varied menu full of colourful Italian dishes at their restaurant and can cater for private parties of up to 60 guests upon request. 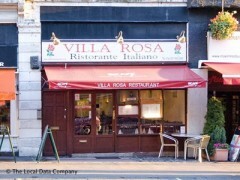 Villa Rosa is our favorite restaurant when we visit London from North Carolina, USA. On our last 8 day visit to London we ate there 6 times taking friends from England and later friends from South Africa. The food is excellent as is the service and presentation. Would recomend this to any person looking for excellent food. We are returning to London in March and plan on making Villa Rosa our first stop after checking into our Hotel. Fabulous for a family on a budget. Good range. plenty of pasta options - good size serves at a good price. particularly recommend the Spaghetti Amatriciana. Individual pizzas are good too, so plenty of choices for picky children! Service excellent. No problems providing water at no charge. The food and service at Villa Rosa is consistently top notch, and we have never had a bad meal or unpleasant experience at this very friendly, attractive restaurant. It has been established for many years, testimony to the wonderful quality of this dining experience. They make the best Spaghetti Carbonara in town, and the reasonable prices keep us coming back.